I’m very excited to introduce our first guest blogger, my friend Fiona. She qualifies to write a post because she lives in the same “small” town as we do, and recently visited the World’s Largest Rubik’s Cube, as well as the World’s Steepest Inclined Passenger Railway (which will be featured in a future post). Not that I’m a stickler for qualifiers. I welcome any guest blogger with a BIG story to share. These sites are in Knoxville and Chattanooga, TN, respectively, and a LONG way from where we live. But Fiona was traveling to Baton Rouge, LA with her husband K. and son C. to visit the University of Louisiana. Background: at the tender age of ten, C. already knows he wants to attend LSU, pretty much because the school’s mascot is a tiger named “Mike.” He’s had a thing for tigers since before he could walk. His pet cats Anakin and Luke are sorry substitutes. Knowing about their trip, I asked Fiona if she was willing to accept a “Go BIG” assignment. Actually, I cajoled, and kinda guilted her into it. But Fiona’s game for just about anything, especially where playthings are concerned, since she used to own a toy store. (Now, she’s training for a 5K, living the Tao, and planning our next scrapbooking weekend. She’s multi-faceted, that one). I forced the address details upon her, and they were off. Good thing Knoxville was actually on the way to Baton Rouge. Fiona is also the talented designer behind the delightful “Go BIG or Go Home” banner. Want to contact her and get her mad skills working for you? Her company is Enlightened Solutions. Driving to Lousiana for vacation, my husband, son and myself decided to break up the drive, and spend the night in Knoxville, TN. 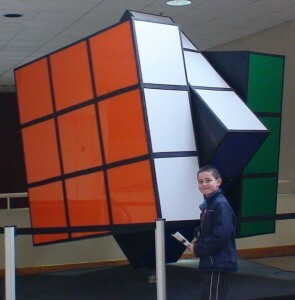 We stayed at the Holiday Inn, which is home to the world’s largest Rubik’s Cube. We chose Knoxville because we had never been there before, and it was about half way on the drive. (And Traci left me no choice). My husband and I are both from the era of the Cube of Rubik, so we were jazzed to see it and tickle our childhood funny bone. It’s located on the top floor of the hotel, at the entrance to the Knoxville Convention and Exhibition Center. Solved! Beat my best time, too! While it was fun to say we saw it, it did not live up to expectations. 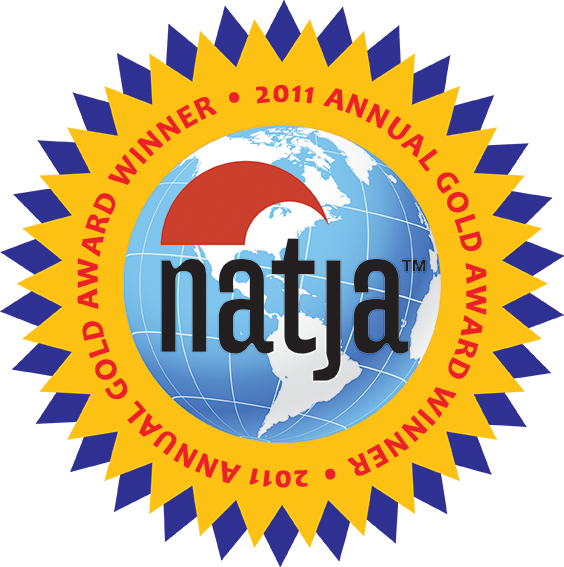 We hoped that this icon would have been given more respect. The Rubik’s Cube enjoyed a resurgence on its anniversary a few years ago when I owned a toy store. Seems like a missed marketing opportunity, if you ask me. Ask the front desk for its location, and they will answer half-heartedly. Sadly, the cube is shoved in a corner of the hotel, not plugged in, and dusty. The puzzle is in the “solved” position, and one of the levels is twisted apart from the other two, as if in mid-turn. It was, at one point, electrified into motion. I would rate it a 1. If you are a Rubik fan and happen to be near the hotel, stop in. Otherwise, keep on driving. 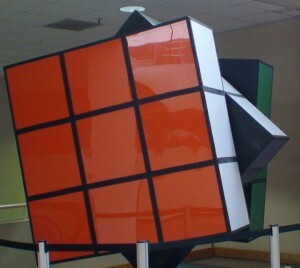 The cube was a gift from the Hungarian government for the 1982 World’s Fair, which was held in Knoxville. It was displayed at the entrance to Hungary’s pavilion, to commemorate its invention by Hungarian architecture professor Erno Rubik in 1974. The cube is motorized, though presently the motor is not used. It is ten feet tall, and weighs 1,200 pounds. The panels each weigh about 300 pounds. The central section of the cube, containing the motor which turns it, weighs about 600 pounds. The Rubik’s Cube is the world’s biggest-selling puzzle game, having sold in excess of 350 million units worldwide. The cube has 43 quintillion different possible configurations (that’s 43,252,003,274,489,856,000), and only one solution.